One singular concept from science fiction has always intrigued me, more so than robots or faster than light travel, and that is the concept of Psychohistory, as described in Isaac Asimov’s Foundation series. This is a science that treats individual humans like individual molecules in a fluid dynamics problem. Just like you can calculate how an ideal gas will flow around an airplane in aerodynamics, Psychohistory can predict how a sufficiently large sample of humanity will “flow around” circumstances such as the collapse of a galactic empire. But we’ve already come upon one of the major limiting factors of Psychohistory: it has to be employed on a population that is large enough to minimize the ability of one regular individual to radically alter a statistically significant quantity of others. It also requires clinical-style blindness: the people it’s being used on must be largely unaware of its use, and especially unaware of the corrective actions made under the advice of a Psychohistorian. I’ve also enjoyed the study of economics, especially on the macro side. I imagine it’s for much the same reason, because it allows the treatment of intelligent humans as a mathematical system that can be tweaked and poked. I never really made the connection before last week, when I realized it while driving to class from work (resulting in “Psych Hist as Econ”) on the back of my hand to remind me. Of course, Wikipedia made the connection ages ago, and links to the macroeconomics article from the Psychohistory (fictional) article. Now, I’m sure Asimov didn’t have this in mind when he wrote it, but the two are actually strikingly similar, especially when the Seldon Plan is considered. In macroeconomics, and especially laissez-faire economics, certain things escape the effects of market forces: things such as roads, and utilities, which are called “natural monopolies” because it’s not practical to have three different companies all build parallel roads and compete for your business. But in the Foundation books, something similar happened, with the eponymous Foundation. Through Psychohistory, Hari Seldon found that the collapse of the Galactic Empire was inevitable, so he set aside a backwater world and began building on it a Foundation to act as a repository to all the knowledge that would be lost with the fall of the Empire. Once this was collected, it could be more easily redistributed, shortening the length of the chaotic interregnum by orders of magnitude. Although humanity would eventually piece together the knowledge to return to the stars without the Foundation, it would involve many more years of barbarism and feudalism. Just as the government steps in, outside of market forces, so did the Foundation act to regulate human existence by trusting a great deal of power in it. There’s also an analogy to be made between, say, the trusts of the nineteenth century and the Mule. See, some time after the retreat of the Empire from the edges of the galaxy here the Foundation was built, a power rose in the sector that was known as the Mule. He was a great conqueror who was forming a new empire by quickly and ruthlessly conquering entire planetary systems in days. But just as McKinley stepped in to break the trusts that were gaining too much power and hurting consumers, so did the Foundation have to step in and stop this threat. I’d like to think that someone will one day develop something resembling Psychohistory, and use it to better mankind, but I know that I certainly won’t live to see it. Trying to apply the science to a population in the three-bit billions is like trying to apply market forces to a hunter-gatherer community. Today’s post isn’t ready, and tomorrow’s post got posted half-done. It’ll be worked out, but I’ve got class now. We’ll talk later. A recent Technician article attempted to educate the student population of the consequences of rising gas prices, especially rising diesel prices which manifest themselves most clearly in increased transportation costs that effect literally every sector of the economy. But from the very beginning, the article steps out on the wrong foot, by positing that ethanol fuel is a “more viable, less costly” alternative to gasoline. Well, the first charge is ambiguous to the point of meaninglessness, but the second is easily refuted. If ethanol were less expensive than gasoline, the free market would adopt it. The fact that it requires tax credits and subsidies to bring the fuel to market proves this point. It gets even better: even with an incredibly sloped playing field of huge taxes on revenues from oil, and tax credits for producing ethanol, it is still more profitable to produce gasoline and diesel. Now, I realize that ethanol has always been a “green” solution, which may or may not be the case: that’s outside the scope of this column. However, attempting to cloak the effort in a shroud of economic credulity is dishonest. Speaking of attempting to lend economic credulity, the further statement that “alternative fuel sources will truly be the only way to lower fuel costs” is so sickeningly ignorant, it’s hard to believe. To keep things political for a moment, it is a cinch to decrease fuel prices by decreasing the ridiculous taxes that are constantly being imposed on Big Oil’s “windfall” profits, which it is perceived that they have extorted from the American public by selling them a commodity that they require. The oil companies are in the business to make money, and the only way to profit is to increase prices so that revenues (money coming in) are higher than expenses (operating costs such as taxes). But to take to an even more basic level, of the sort you find an introductory economics text, by using the fundamental principle of supply and demand, it is obvious that price can be lowered by increasing supply. This can be done in a number of ways. The first and most public is to stop relying on foreign oil and tap the oil reserves we have right here at home, including those in the Alaskan National Wildlife Reserve. But another much ignored way is to build more refineries. According to Reason Magazine, the United States’ “149 existing refineries have been running at maximum capacity,” because no new refineries have been built in 32 years. This is because of ridiculous environmental legislation that means that, once again according to Reason, a refinery being built outside of Yuma, AZ, is nearing its completion date in 2010, 15 years after the project began. Returning the article, it goes on to simultaneously delve into fantasy and legitimate economic theory by stating that, “If there is an alternative, and if that alternative is relatively cheap and feasible, then the demand for gas would fall and that would help to lower the price.” This is absolutely true, and as stated above, if it is more profitable to sell this alternative fuel than gasoline, then the market will shift that way. However, this statement begins with two predicates, the second of which (“if that alternative is relatively cheap and feasible”) has yet to be fulfilled. The article continues by stating that “As long as things stay the way they are right now and we don’t develop that energy, then you can expect the price of gas to stay pretty high.” While this is true, it is a type of true that is called “tautological” which means that it is always true regardless of circumstances. The quote can be reduced to the logical statement that “if nothing changes, then nothing will change”, which can be patently seen to be factually empty. The article does cover one of the other chief bottlenecks in our supply of oil (which keeps supply low, and therefore prices high), the Organization of the Petroleum Exporting Counties (OPEC). OPEC is an alliance of nations with no meaningful exports aside from oil, whose economies are only kept going by the fact that the country was lucky enough to sit atop huge oil reserves. If the same nations and cultures had to cope with, for example, the rocky soil and tougher conditions of Europe, they would fail utterly because they have nothing to offer the world except keeping the oil flowing. Allow me to illustrate the character of OPEC. In October 1973, a number of nations led by Egypt and Syria attempted to gang up and invade Israel on their holy holiday of Yom Kippur, in a conflict later called the Yom Kippur War. But Israel, never one to be pushed around, rallied back and purged their land of the invaders and defended themselves ably. Sore from this stinging defeat where a superior force was defeated by an army on their day off, the OPEC nations decided to stop shipping fuel to any nation that had supported Israel in defending their homeland from encroachment, leading to the famous 1973 “Energy Crisis” here in America. The fact that our government is keeping us reliant on these thugs and endangering national security is astounding. Having both played the games in question, and given this some thought along the way, I found this conclusion somewhat lackluster, because they didn’t even touch on any of the interesting stuff. While the article has as its thesis realism in games, it doesn’t actually delve into the topic of which mechanics specifically are designed to enhance this sense of realism. Well, that is, aside from a section about projectile penetration, especially expectations versus reality for weapons like shotguns. For example, something that’s been appearing more and more, it seems, is a stamina system, coupled with the ability to sprint. Essentially, in real life, you can only sprint so far, jump so many times and so forth. The most popular and conventional way to abstract this is to have a system where sprinting and jumping subtract from your stamina, where standing or crouching increase it. Unfortunately, this is one of the areas that I feel that Call of Duty 4, one of the games mentioned, falls flat. The developers chose to make the multiplayer maps relatively small, and they also strictly restrict the distance that you can sprint, as well as not having any visual indicator of your remaining stamina; more than once this has left me sprinting across a street only to slow to normal speed halfway through and never make it all the way across. On the other hand, America’s Army has some enormous maps, and in any given round, the first ten to thirty seconds is spent sprinting into position. But I believe there is actually something larger than “fun versus reality” at play here, although it is still related to the enjoyability of the games. However, there’s a point to be made that the more unrealistic games cited, COD4 and Rainbox Six: Vegas 2 are both cross-platform titles, that were designed to be playable on both the PC and the XBox 360. What this inevitably results in is a less detailed game, overall, it seems, simply because the controller of the 360 can’t compete with a mouse and keyboard for flexibility and multi-purposing. Take last year’s super-mega-hit Bioshock, which was likewise developed for both PC and consoles. It was a first person shooter, but had many characteristics of a role playing game (RPG), such as the ability to have upgradable personal powers and to carry around an assortment of items with you. In most traditional RPGs, this is put into abstraction by having a grid representing your backpack, and you can carry whatever you can fit in that grid; here’s an example from my old friend Planetside. But in Bioshock, realizing that managing such a system with the controller was infeasible, the system was left behind in favor of just having hard-and-fast limits. You can only have x shotgun shells, y machine gun bullets, and z health packs. Whereas in other games (and reality) it would be possible to ditch the shotgun ammunition for more rifle ammo, that ability was lost in the shuffle. Of course, it’s hard to talk about realism in video games without talking about S.T.A.L.K.E.R. : Shadow of Chernobyl (PopMech, I’m lookin’ at you.). This game has a stamina system and tries to be very ballistically accurate. Also, the inventory system is, unusually, not ruled by how many things you can fit on the grid, but instead by the overall weight you’re carrying. Anything above 50 kg and you start getting winded walking around and sprinting is almost unworkable. (If you have trouble visualizing 50kg as I did, IGN has a helpful guide to this topic) Stalker even makes a point of making silencers as useless in 99% of situations as they are in real life. From the fact that Stalker sold well enough that they’re making a sequel, and America’s Army is well-liked enough to still be actively played today, despite looking the same as it did when it was released 6 years ago, there is clearly a niche market for the realistic shooter on the PC. Given how terribly the AA console version fared, and the fact that the most popular console games of all time, Halo(s) 1-3, are fantastically unreal (think “orbital lasers”, here), I think it’s safe to say that the same niche doesn’t go in for the console play. Given that I’ve spent good amounts of time with each of Stalker and AA, and find non-realistic shooters hard to play (sorry, TF2) I’d say I’m definitely in this niche, which means that it looks like I’ll be gaming on the PC for some time to come. Well, the reactions from the “Make them pay!” end of the spectrum have been widely documented elsewhere, and I wish that their effect were better documented, because I would estimate them to be statistically insignificant. A recent poll in the student paper of students on the topic of illegal downloading quoted various students as saying that all the RIAA’s suits will do is cause them to illegally download from non-university computers. Set a speed trap on the same stretch of highway for years and people will keep speeding elsewhere. And one thing that I wish were getting more attention is the fact that the RIAA is allegedly keeping all the proceeds from the lawsuits for themselves. You know, the lawsuits whose damages were justified as recompense to the artists whose work was stolen. Yeah. So how about the “Let them not pay!” crowd? Well, in descending order of publicity, let’s start with Radiohead and their recent In Rainbows album. As near as I can tell, the Radiohead folks decided to make a bold move to get a lot of attention, and once they got it, they’ve tried to ignore it. See, they decided to release their album as an MP3 download where the downloader was prompted to enter the amount he wished to pay for the album (Sight unseen, I might add). This allowed a dynamic range all the way from normal album price — or higher if you wished — down to literally no money at all. But they didn’t use any unusual licensing, and they only allowed the downloads for a few months before the discs hit stores, including issuing the album on vinyl — how progressive. But they’ve refused to publicize any information about the offering, as far as numbers of albums bought and the average price, meaning that the best data comes from the internet equivalent of exit polling. It’s hard to say whether a sample size of 3000 people is statistically significant given that Radiohead won’t even talk about how many times the album was “sold”, but my gut is telling me that it isn’t. Wikipedia also indicates that they’ve waffled by a factor of 30% on the sales figures for the album itself, as well as downplaying favorable reporting of widespread “purchase” of the album. With the latest NIN studio album, Ghosts I-IV, is actually a 4-pack of 9-song mini-albums, released without a record label in various digital and physical media. But the most attention-grabbing feature is the fact that the first quarter of the album, referred to as Ghosts I has been released for free (as in beer) under Creative Commons license. The easiest official way to get it? From NIN’s Pirate Bay tracker. The entire album can be had for a $5 digital download, in high-quality forms with no DRM. Wikipedia also tells me that the hard copy of the album on CD will be quite reasonable $10, with a code for a free digital download of the whole album as well. And the $75 deluxe edition will come with the closest thing to open-source you can get in music: multi-track recording files of the songs for remixing. By all accounts, the record is doing smashingly, which I figure to be a result of the heady brew of the radical distribution medium, the ridiculously low price, and the ability to “try before you buy” with the shareware album. Now, Reznor has always been a bit of a radical in trying new things — remember that Quake thing? — but this seems to be a real step up, and I think it was masterfully executed. And finally, perhaps as a bit of an anti-climax, we have Jonathan Coulton. He hasn’t really released any albums per se, he just has a huge library of songs he’s written, where you can listen to them all and even get some for free. Technically, as they’re all licensed under Creative Commons Attribution-Noncommercial, it would also be legal to obtain these without paying (and only without paying, hence “noncommercial”) from anyone who has bought them, or who likewise received them legally from someone else. That’s why Coulton makes it easy but not necessary to give him money: if you’ve heard his stuff for free and want to say thanks, you can toss a few bucks his way in a direct donation, or actually outright buy the songs you had obtained through other means. He’s gone on record as saying that his Thing a Week project, to produce some form of musical piece every week for a year, was in part a test of whether he could make a living off of doing just that and releasing the works under a CC license. Since he’s still at it, I can only assume that the experiment was a success. I am not for piracy, you really should not steal music, but this is not the solution. Like most “anti-piracy” measures, this one will not stop any pirates. But it will make it difficult for you to listen to these songs on your iPod. At best, you have to jump through a few hoops and spend another buck on a blank CD. You might even need to break the law. TO LISTEN TO A CD YOU BOUGHT WITH ACTUAL MONEY. Picking up where we left off, we have one final album purchase to explain: Dragonforce’s Sonic Firestorm. This is a band that I became familiar with through rather unusual means. These days, the site ytmnd.com is a vulgar land of little civility, but in times past, it was a place of great humor. Essentially, it allowed you to create a page with a tiled background image, some large Word Art-style text with a looping sound clip. For example, the genesis of the website was an image and sound byte from Finding Forrester, which depicted and played the sound of Sean Connery’s character proclaiming to another character, “You’re the man now, dog!” (That’s also where the acronym ytmnd came from.) It might not sound like much, but the simple elements could be combined adeptly and to great effect. At any rate, within this community, memes started to form. Probably the best example is the PTKFGS meme, which comes from another Sean Connery exclamation in Finding Forrester where he tells the same character to “Punch the keys for God’s sake!” This was a delicious bit of meta-humor, because the PTKFGS world was the Bizarro World of YTMND where everything was turned on its head. So anyways, many of these memes were based around a common theme, which is to say that they used the same sound clip, usually a song. Some clever fellow in the YTMND community decided it would be interesting to collect these popular songs into a YTMND soundtrack. It was a sort of eclectic mix tape of extremely catchy songs (used because catch tunes kept eyes on your page) and distributed for free. A number of the songs I heard there are fondly remembered, but only one is relevant to the discussion: Dragonforce’s “Fury of the Storm” from their studio album — you guessed it — Sonic Firestorm. I was sold on the music, without having to pay for the sample. Now, this is really nothing new, what with the whole radio thing. But, of course, there was a time when Big Content wasn’t too happy with radios “giving away” music. There’s also certainly something to be said for the fact that I’m looking at picking up some Boston albums, what with hearing them all over the airwaves, again for no cost to me. But I feel there’s an important distinction to be made here, to prevent the sweeping generalization that the radio should be good enough: Dragonforce will never appear on the airwaves, except perhaps during the local college radio station’s chainsaw rock-block — and even then only as a “softer” reprieve. An ad in the paper that is genius of marketing. 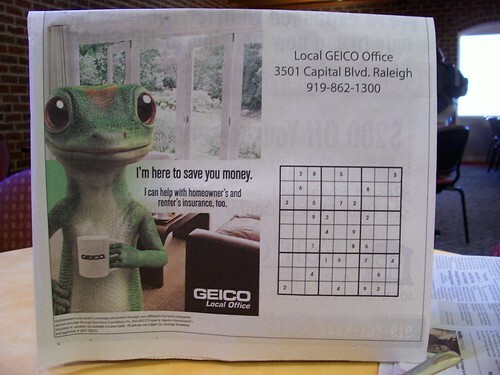 Students prize the sudoku in the paper for a diversion from class, so putting one in your ad will get lots of eyes. 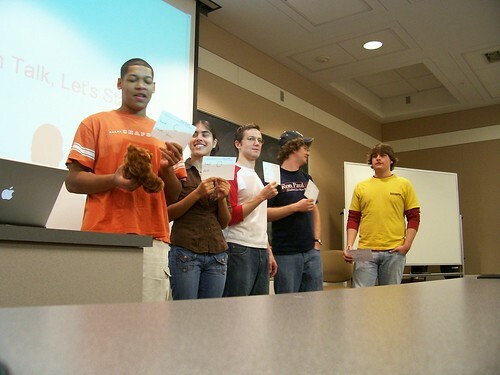 An exercise in computer science class to demonstrate linked lists by having people act it out. Some of these people are going to have a hard time in “Data Structures” next semester.